Boris came to In-Sync in August 2000 along with 6 other cubs. He was underweight by 15 lbs, a lot for a cub of 2 1/2 months old. He was loosing his hair due to the ringworm, mange and impetigo that infested his body. He was so set back by his illness that he took his treatments without protest. 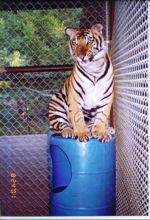 When Boris first came to In-Sync, his favorite place to sit was in his tub of water. 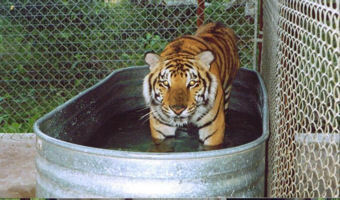 Tigers love water, but we also think it soothed his irritated skin. Boris was neutered with the help of renowned veterinarian Kathy Quigley from the Hornicker Wildlife Institute. Boris was smaller than his brother, Mohan, when we first got them, but soon grew to outweigh him. His nickname was Bucket Head because he would put his head in a bucket and walk around with it on his head. Tragically, we lost Boris on August 10, 2002 to an impaction of the secum. He is truly missed everyday with heart-filled emotions.